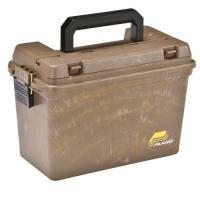 The Plano 1612-30 Shell Case guarantees you'll never need to look for another storage case again! This one absolutely offers more than what you need, keeping it reliable, convenient, durable and most importantly--dependable! The large lift out allows far more space underneath than what you'd possibly ever use, while the dexterity of the case ensures all of your gear remains safe and protected. The high-tech latches give you that promise that nothing will become in disarray when you're carrying this item on the move! It's more than practical to most, and helps to have space for practically every field item one might need. If you weren't aware, this case can hold double the shotgun ammunition as other Plano cases, while also having room for numerous other tactical gear as well. This is real quality, and definitely awards you with a trustworthy shell case you'll be able to turn to for years to come!